I used to think that if I was really rich I’d spring for a driver, but I’ve changed my tune. Make it a personal chef. And that’s what I had a couple of weeks ago when I participated in Maya Bradstreet of A Recipe for Wellness’ Whole Food Cleanse. I’ve done juice cleanses out the wazoo and, frankly, have had enough of them. I like juice as a meal replacement, but did not see the benefit of five days of nothing but liquids. It made me into a crankier, hungrier version of myself, and any weight I lost I promptly gained back. Maya’s cleanse is an entirely different ball game. For five days, you’re provided with three meals plus snacks, made up of whole healthy foods that give your organs a rest. You’ll address some habits (no caffeine, sugar or alcohol allowed), and lose a few pounds in the process. And believe it or not, the food is delish. From coconut chia pudding topped with peach mint basil compote for breakfast, to myriad warm and comforting soups for lunch, most of it was scrumptious (except the groats. Please, no groats). I’ve got to try her recipe for energy truffles – nut free, they’re a blend of coconut butter, cacao butter, cacao powder, dates and shredded coconut and as satisfying (at least for me) as the real deal. I looked forward to Maya’s daily missives, full of info about the next day’s delivery, its impact on your health, and always plenty of encouragement. Maya filled our bags with interesting snacks, too. I have a new fondness for coconut chips, maple water and seaweed crisps. 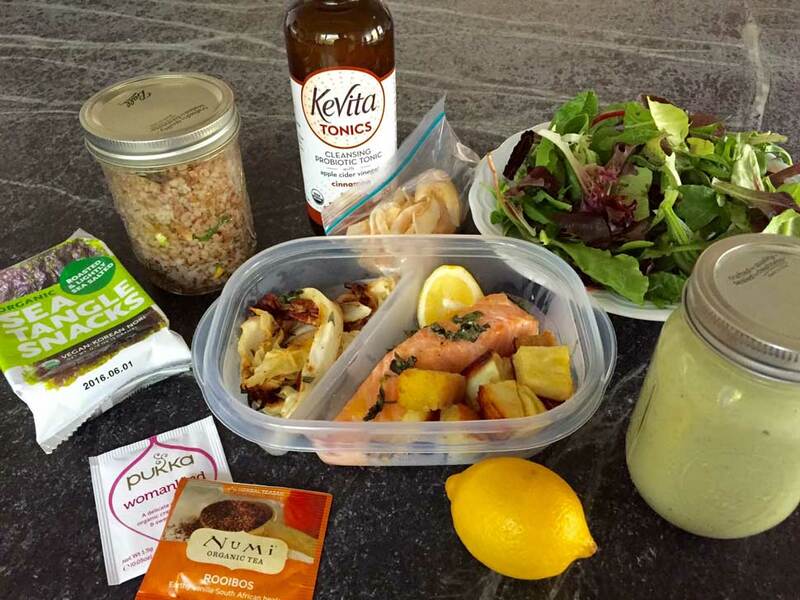 You can participate in the Cleanse a number of ways: follow along and she’ll provide the recipes, participate at the breakfast, lunch and snack level and you make dinner (according to her recipes), or the full monty: breakfast, lunch, dinner and snacks. For me, it was a welcome respite to a few weeks of over-indulging, I lost a few pounds, my tummy was visibly flatter, and I LOVED the break from the kitchen. While I’m certain to go back to coffee, chocolate and wine, I’ll be signing up for another week of clean eating with Maya. 1) You’re tired of feeling tired. If you’re rundown: waking up exhausted, experiencing headaches, brain fog or unexplained skin or GI symptoms, your body needs a reboot. A detox allows the body to focus on elimination; by clearing the junk we allow our new innate energy to flow again. 2) You want to kick a caffeine, sugar and/or alcohol habit. We all have vices, be it a snack attack or the need for a jolt of energy mid-morning, or a glass of vino to unwind at the end of the day. That said, if you feel like you can’t start or complete your day without these rituals, it may be time to investigate why and be more in control of your food choices. 3) Your immune function is compromised. Whether you have a chronic illness, autoimmune disease, or you have trouble fighting off every cold you’re exposed to, your immune system needs some help. Reducing inflammatory foods allows your immune system to relax and re-balance. Even better, as you introduce foods back into your diet post-detox, you can determine which foods are triggers for you and cause any food sensitivities or reactions. 4) You and your body have become an afterthought. Self-care is so important. When you feel good, you can do more, and take care of others better. Detoxing gives you an opportunity to re-focus on yourself and your own needs. Getting in touch with your inner-self and intentions also just breeds more mental and emotional balance and clarity! 5) You could stand to feel a bit lighter. Of course, one outcome of detoxing is weight-loss. While I encourage clients to focus on other goals, on average they will lose 2-10 pounds. It’s very important however, to transition back out of the cleanse carefully so you don’t do a 180 and ‘yo yo diet’, gaining back the weight and then some! Click here for Maya’s Healthy Apple Butternut Squash Soup Recipe.